Mrs. Maria L. Brown an old resident of Christie died Aug. 9 at the Neillsville hospital, where he had been cared for since July 22, when she fell and fractured her hip joint and sustained other injures. Maria Louise Simons was born at Brothertown, Brown County, Wis., July 3, 1851. She was a descendant of one of the Six Nations a federation of six Indian tribes of Central New York, some of whom were allotted a reservation in Brown County, Wis. Her father, James Simons, was born in New York and came with his people to the Wisconsin reservation when a small child. He became a prominent man serving as Justice of the Peace for many years and was highly respected. Mrs. Brown grew to womanhood at Brothertown and was married to Sidney Brown, May 25, 1896. They came to Mr. Brown’s farm near Christie soon after and remained residents of that community. Mr. Brown died a number of years ago. Mrs. Brown leaves no children of her own. There are two sons and two daughters of Mr. Brown’s first marriage. Funeral services were held at Lowe’s Funeral Home, Rev. G. W. Longenecker officiating. Burial took place in Christie Cemetery. The pallbearers were Ferd Wiesjahn, Geo. Harper, Julius Bohnsack, Matt Schaefer, Dan Timerson, and Irving Young. Jess Scott sang several selections, his wife accompanying on the piano. Mrs. Brown was a woman of many fine qualities and was well liked in the Christie community. For the past four years a neighbor, Mrs. Harper helped to care for her. Grandma Wilber passed away into her everlasting sleep Feb. 18 at the home of her son, Charlie Wilber, with whom she has been living for two years and a half caring for her three grandchildren. The aged mother was 83 years, 10 months and 13 days old when she died. The funeral was held in the school house, Rev. C. L. Frederick of Greenwood officiating. She was buried in the Dodgeville cemetery. Eugene Wilber of Mellen attended his mother's funeral. Mrs. O. M. Sharon of Gravesville was here to attend her mother's funeral. She returned to her home Tuesday, taking her brother's three children with her. CARD OF THANKS. We wish to return thanks to neighbors and friends of the town of Beaver who assisted us during the sickness and burial of our mother, Mrs. Charlotte Wilber. Eugene Wilber, Chas. Wilber, Mrs. O. M. Sharon. Clayton Johnson, age 76, a pioneer resident of this community, having lived here the past 60 years, was instantly killed Monday night at 11:15 o’clock when he was struck by an auto driven by Arnold Edblom, age 26, of the town of Unity, on Highway 13 opposite the Ed Witte service station. Arthur Edblom, his brother who accompanied him, said Johnson was walking in the middle of the west half of the pavement... The accident, he said, occurred while it was raining, and the circumstances did not warrant an inquest... Johnson was walking north on his way home and the Edblom brothers were traveling south toward Unity. Edblom said he was proceeding at about 25 miles an hour and that, because of his headlights and the light from a street light at the intersection blending at the time, he was unable to see Johnson until too late to avoid him. He said he notified a physician who instructed him to call authorities... Johnson, of Indian descent, was born in Calumet Co on May 24, 1866, and came to this area with his parents about 60 years ago. He worked as a lather and shingler. In his younger years, he was well known as a baseball player and umpire and as a musician in the community band. In late years, he was known as Colby’s most avid baseball fan. He was married to Isabel Graham of the town of Hull who died 34 years ago. Survivors are a son, Oscar, of Racine, a daughter, Mrs. Cecelia Burt of Rockford, Ill., a brother, Bert of Eau Claire; a sister, Miss Harriet Johnson, who teaches at Kenosha. The deceased was of a congenial disposition, friendly and polite with all, and enjoyed a wide circle of friends who will miss his friendly companionship. Funeral services were held at the Lulloff Funeral Home, Rev. A. C. Riley officiating, and internment was made in the Colby cemetery. Contributed by Elmer Noah & Shelly (Noah) Holm. 6 Apr 1916 Bill of Sale from S. J. Stienstra to Standing Buffalo with Louis Looking Glass (his father) and George Green Grass as witnesses. Lucy Funmaker, Indian, wife of Harry Funmaker, died Sunday morning at the Menigoz farm (Eaton sec 12, SW corner) southeast of Greenwood, at which place several families were camped while working on the farm. She was nineteen years of age and had suffered from tuberculosis the past year. G.W. Bishop conducted the cortege to the Greenwood Cemetery, where short services were held by rev. W.T. Hendren. Funeral services for Mrs. John Waukon, nee Mary White Beaver, 80, who died at her home in the Town of Mead (Clark Co., Wis.), 8 miles northwest of Greenwood, were held at the Schiller Funeral Home. The Rev. Ben Stucki, superintendent of the Indian School at Neillsville, officiated at the rites, and interment was made in the Greenwood Cemetery. Pallbearers were August Kippenhan, Bud Osborne, Charles Krapf, Theodore Kippenhan, and Arthur Noah. Mr. and Mrs. John Stacy of the Indian Mission at Black River Falls attended the funeral. Stacy Estate Cemetery: 1994 Plat Map “Tillie Stacy ETAL” (old maps = “Indian Land”) Mead twnshp sec 35 & 36 (cemetery not noted on maps). Monegar, John William 7 5 1944 2 4 1978 Clarence Monegar & Tillie Poppe. John H. Stacy, 88, of the Neillsville Memorial Home, died at the Neillsville Memorial Hospital. Services were at the United Church of Christ, Rev. Loren W. Hickerson officiated. Burial was in the Winnebago Mission Cemetery, Black River Falls. Pallbearers were Kenneth Buker, Sidney Lewis, Clarence Monegar, Paul Fox, Brett Garthune and Richard Schleifer. Deon Spangler was the organist and singers Mona Garthune, Marsha Fox and Martha Riola. He was born Dec. 16, 1899, in Jackson County, to John and Martha Stacy. He attended school in Black River Falls. He farmed in the town of Mead for many years. In 1957, he retired from farming and began work as a wood pulper. In 1967, he began working for the Green Thumb program in Clark Co. He retired in 1977. He entered the Neillsville Memorial Home in 1984. He was a member of the Winnebago United Church of Christ in Black River Falls. He is survived by two sisters, Mrs. Tillie Buker of Willard, and Mrs. Helen Stephens of Minneapolis. He was predeceased by his parents, four brothers, and three sisters. Mrs. Esther Stacy Lewis passed away March 5th, 1944 at Eau Claire Mt. Washington Hospital. Mrs. Esther Stacy Lewis, daughter of Mr. and Mrs. John Stacy, was born in the town of Komensky, Jackson Co., Wis., on May 25, 1914. She was baptized in the Christian faith by Missionary Jacob Stucki on July 5th, 1914. Soon thereafter her parents moved to their farm in Clark Co, in the town of Mead, near Greenwood. There she attended Christian religion instruction and was confirmed by Rev. O.J. Vriesen of Immanuel Church. Her membership was later transferred to the Winnebago Mission Church, of which she was a member the remainder of her days. She attended public elementary school and high school in Clark County and received several years of college training at the Mission House College at Plymouth, Wis. A serious breakdown in physical health prevented her from competing in college course. Following her recovery she returned to the home of her parents, her father having accepted a position as Evangelist in the Indian Mission under the board of national mission of the Evangelical and Reformed Church here in the mission church. She performed useful services as Sunday school teacher and for several months as assistant parish and community worker. A little over a year ago she left home to enter the Cook Christian Training School at Phoenix, Arizona. While a student in this school she was united in marriage with Mr. Sidney R. Lewis on March 14, 1943. From this union a son, Sidney Cyrus Lewis was born Jan. 18, 1944. Failing health had prevented her from continuing her studies and induced her to return with her husband to Wisconsin. On March 5, 1944 at the age of a few months lacking 30 years she received the summons from the Lord to depart to her Heavenly Home. She leaves to mourn her departure, her husband and infant son; her aged parents, Mr. and Mrs. John Stacey; two sisters, Mrs. Eric Stephen of Minneapolis, and Mrs. Matilda Monegar of Black River Falls; two brothers, John of Greenwood, and Alvin of Black River Falls. Funeral services were held at the Indian Mission church. The Rev. Ben Stucki officiated. Miss Irene Whtegull sang one song “Under His Wing” and pallbearers were Jesse Stacy, John Kingswan, Chloris Lowe, Morris Stacy, Daniel Lowe and Geo. Lewis. 1932: Miss Emma Stacy, daughter of Rev. and Mrs. John Stacy of the Reformed Church Indian Mission north of Black River Falls, was married Sunday, June 12, 1932, to Clarence Monegar of Wittenburg by Judge O. W. Schoengarth at Neillsville, Clark Co.
Funeral services for Mrs. Clarence Monegar, who died March 5, 1942, at River Pine Sanatorium, Stevens Point, where she had been a patient since April 1941, were held at Black River Falls. Interment was made in Black River Falls. Mrs. Monegar, the former Emma Stacy, daughter of Mr. and Mrs. John Stacy, former Greenwood residents, who now reside in Black River Falls, was a graduate of Greenwood High School with the class of 1930. Besides her parents and husband she is survived by a son, Clarence Jr.; three daughters, Mona, Marsha and Martha; three sisters, Mrs. Eric (Helen) Stevens, Minneapolis, Miss Esther Stacy, Black River Falls; and Miss Lilly Stacy, Greenwood; and two brothers, Alvin Stacy, Black River Falls, and John Stacy, Greenwood. A brother, Joseph, preceded her in death in July 1941. “...Clarence Boyce Monegar was a Native American Indian. He was born in Wittenberg, Shawano Co, Wisconsin on April 10, 1910 into a family that knew desperate poverty. His father provided for the family by working in the cranberry marshes. Then, the 1918 influenza pandemic invaded the country, wiping out many in the Winnebago tribe including Clarence’s father and four siblings. Clarence, his mother and two brothers, Joseph and Russell survived... The Reverend T. M. Rykken was impressed with Clarence’s drawing ability while he was a student at the Parochial Indian School in Wittenberg and arranged for him to attend the Indian School in Tomah... His paintings exhibited great attention to the smallest detail whether a scar or wrinkle in the face of an Indian Chief or the subtle colors and patterns of feathers on a pheasant. He returned to Wittenberg for high school but dropped out after the first year to help support his mother and brothers... Back in the Black River Falls area Clarence found work as a sign painter. As the community grew, Clarence’s designs and drawings showed up on store fronts and truck doors. His reputation as a creative artist grew by word of mouth. It was a living. In 1932 he married Emma Stacy, the daughter of a prominent Indian family. Encouraged by Emma, he once again dabbled in drawing. Their family thrived until catastrophe struck Clarence’s life once more. Emma contracted tuberculosis and passed away in 1942, leaving him with four young children to care for. The responsibility of a family was overwhelming for the young Native American man and he drifted... Traditional tribal custom sometimes dictates replacement marriages and Clarence would have married Tilly Stacy, Emma’s sister under this tradition. Also, Tilly’s sense of loyalty to her sister and her sister’s children would put her in a position of accepting Clarence as a husband. She loved the children and provided a home for them. Clarence deserted his family, leaving them at a time when they needed their father the most. He lost his job as a sign painter, drifted, drank and didn’t support his children or his new wife. Complaints landed him in the Neillsville jail for non-support of his kin and public drunkenness... Whatever art Clarence submitted was sold. During this time Clarence started to sign his drawings with his name and to also draw a very small arrowhead after his name to signify his Native American culture in a predominantly Euro-American audience. This all came to an end in 1945 when Clarence Monegar was drafted into the army to serve as an ambulance driver. Clarence returned to Black River Falls in May 1946. His wife, Tilly was in Greenwood, caring for his four children as well as her and Clarence’s son, John who was born in 1944. The Black River Falls tribal office staff helped complete the paperwork for his military discharge, provide for financial aid and re-establish a relationship with tribal members. Once he finished these formalities Clarence stayed in the area for a very short time. His children didn’t know him and Tilly didn’t need another mouth to feed. Fatherhood and family responsibility were not part of Clarence’s vocabulary and he again deserted his family. Tillie Stacy Monegar (10 Mar 1912 – 30 Sept 2000) next married on 15 May 1949 to Ervin E. Buker (14 Dec 1917 – 25 Feb 1983). Clarence reverted back to his earlier pastime of drinking and drifting, painting and peddling... It is estimated that, over the course of his life, he painted over 8,000 pictures and peddled them all himself going door to door, shop to shop, tavern to tavern and then he drank the profit... Clarence married again and had five more children. He remained married to his third wife, Melba until his death, July 16, 1968 at the age of 58. It is said that Clarence’s family was never able to afford to frame even one of his paintings and Tilly, the woman his first five children called Mother, kept none of his paintings....” Excerpt from the beautifully done biography by Pat (Susa) Sievers. Biography includes photos of paintings. John Monegar, 33, a former Greenwood, resident, now residing in Chippewa Falls, was found dead in his hotel room Sat evening, Feb. 4, 1978. Death was believed to have occurred sometime on Wed, Feb. 1, 1978. A graveside service was conducted at Stacy Estates Cemetery. A memorial service followed at the Buker residence. Rev. James Selmser of Winnebago United Church of Christ officiated. John Monegar was born (to Tillie Stacy and Clarence Monegar, Sr. Note that cemetery has Tillie POPPE as mother of John William Monegar, I think this is in error.) on July 5, 1944 at Black River Falls and attended Greenwood grade and high school. He went to vocational school to become a welder and then worked for a number of years for a Marshfield firm as a welder. He was presently employed as a maintenance man for Northern Colony of Chippewa Falls. Surviving him are his parents, Mr. and Mrs. (Tillie Stacy Monegar and step-father) Ervin Buker, Greenwood two half-brothers, Clarence Monegar, Jr (son of Emma Stacy and Clarence Monegar, Sr.) of Crystal, Minn. and Kenneth Buker (son of Tillie Stacy Monegar and Ervin Buker) of Marshfield and three half-sisters (children of Emma Stacy or 3rd wife Melba and Clarence Monegar, Sr.), Mrs. Mona (David) Garthune of Minneapolis, Mrs. Marsha Fox of Minnetonka, Minn., and Mrs. Martha Sullivan of Duluth, Minn. Preceding him in death was his father, Clarence Monegar, Sr.
To all Elders, Veterans, Family, and Friends; On Saturday, August 25, 2001 at 11:00 am, you are cordially invited to a flag raising ceremonial, Taps, Firing Squad from Fort McCoy, and the singing of our Ho-Chunk Flag Song, honoring Private Dewey Mike for his heroic sacrifice. Private Dewey Mike was Killed in Action on August 30, 1918 in World War I. Dewey is to have a plaque and cemetery named in his Honor. Both Military and Wisconsin Government Officials will speak brief words on behalf of the family. Dinner will be served for all and a giveaway will follow for all Ho-Chunk Elders and Veterans. Location: Township of Levis, Clark County, between Neillsville and Hatfield next to Lake Arbutus. Off Highway 95, take Clark Avenue South, right onto Bush Road to the cemetery in Dells Dam. Bright Feather (No dates) Co. A. Omaha Scouts Neb. Vols. Donald Blackhawk, 78, of Black River Falls and St. Paul, MN, died December 16, 2007, in Abbott North-western Hospital, Minneapolis, MN. Donald was born February 24, 1929, near Black River Falls, to Andrew and Lucy (Wilson) Blackhawk. He was raised in the Black River Falls area and attended the Dells Dam School (Clark Co.). He married the former Georgelene Cavanaugh in North Dakota. The couple lived in Kansas City, MO, prior to moving to St. Paul. For the past eight years, Donald lived both in Black River Falls and St. Paul. Donald was employed as a Native American student counselor by the St. Paul Public School System. He also served as an alcohol counselor for many years, having received his training at a school in Salt Lake City, UT. He also served as a board member for Multi-Cultural Services/Native American Studies—University of Minnesota and was a member of the Ho-Chunk Nation Traditional Court and a Ho-Chunk Nation language instructor. He was a member of the Warrior Clan. Survivors include his wife, Georgelene Blackhawk of St. Paul; two daughters, Geraldine and Lucy Blackhawk, both of St. Paul; six sons, Delbert of Minneapolis and Donald Jr., Mark, Reginald, Gerald and Andrew John Blackhawk, all of St. Paul. He was preceded in death by a son, Russell Dean; a daughter, Lynn Marie; three sisters, Adele (Adelaide) Red Eagle, Margaret Olson, and Virginia Smith; and brothers. Funeral services will be held at at the Blue Wing Community Center, rural Tomah. Burial will be in Decorah Cemetery, rural Black River Falls. Friends and family were invited for visitation at the Torkelson Funeral Home, Tomah, and are invited for services at the Blue Wing Community Center. Adelaide Red Eagle, 89, Neillsville, died July 20, 2002, at Saint Joseph’s Hospital, Marshfield. Funeral services were held, at her home, Neillsville. Burial was at her home. Pallbearers were Conroy, Curt, Doug, George, Jim and Roy Greendeer. Adelaide Black Hawk was born on July 7, 1913, in Black River Falls, to Andrew J. and Lucy (nee Wilson) Black Hawk. She attended the Neillsville Winnebago Indian School and then worked at Model Cleaners in Neillsville for five years. Later, she worked in the laundry department of the Memorial Medical Center, Neillsville, until she retired. She married Guy Red Eagle and was a longtime resident of the Dells Dam area. She was a member of the Ho-Chunk Nation Indian Tribe in Black River Falls. She was also a member of the Andrew J. Black Hawk American Legion Auxiliary Post #129 in Black River Falls and she was a foster grandparent. Her interests included painting, beadwork, crafts, flowers, houseplants and bird watching. Survivors include one son, Douglas (Barbara) Red Eagle, Neillsville; two daughters, Diana O’Brien, Black River Falls, and Janice (Allen) Cummings, Sun Prairie; and one brother, Donald (Georgelene) Black Hawk, St. Paul. Preceding her in death were three brothers and two sisters. Janice Fay (Red Eagle) Cummings, 57, of Sun Prairie, passed away Dec. 2 at St. Mary's Hospital, after a courageous battle with cancer. Janice was born In Neillsville on June 30, 1946. She attended business school in Minnesota. She was a member of the Ho-Chunk Nation. She wed Allen Dale Cummings on Dec. 16, 1967. Janice is survived by her sister, Diana O'Brien; a brother, Douglas (Barbara) Red Eagle; her husband, Allen D. Cummings, Sr.; a son Allen D. (Patti Ann) Cummings, Jr.; a daughter, Angelique D. (Todd) Weisman; three grandchildren, Amber, Ashley, and Mason Weisman. She was preceded in death by her mother, Adelaide. A funeral service celebrating her life was held Dec. 5 at Sun Prairie. Diana G O’Brien, age 66, of Black River Falls died June 2, 2005, in Black River Memorial Hospital. The former Diana Gale Red Eagle was born May 13, 1939, at Tomah to Guy and Adelaide (Black Hawk) Red Eagle. She was raised at Baraboo, Black River Falls, and the Dells Dam area in Clark Co. Diana graduated from Neillsville High School and later studied to become a registered nurse. She also received her master’s degree from Portland State University. She married Robert O’Brien in 1968 in Seattle, WA. In addition to having lived in Seattle, the couple also lived in Portland, OR. They were divorced in 1972. Diana lived in Portland until 1996 when she returned to the Neillsville area and then Black River Falls. While living in Portland, Diana was employed as a registered nurse at the Good Samaritan Hospital. Upon returning to Wisconsin she was employed by the Tribal Aging Unit of the Ho-Chunk Nation. She was a member of the Andrew-Black Hawk American Legion Post 129 Auxiliary Unit. Diana loved music. Surviving is her son, Byron O’Brien of Redwood City, CA; a brother, Douglas (Barbara) Red Eagle of Dells Dam (Neillsville). Preceding Diana in death are her mother Adelaide, and a sister Janice (Red Eagle) Cummings. Funeral services were held from the District One Community Center and burial was in Decorah Cemetery, both in rural Black River Falls. Donald Black Hawk officiated. George Carimen, known best by his Indian name (Greengrass), died at Neillsville Hospital, March 2, aged 82 years. George Greengrass was one of the oldest Winnebagoes in this vicinity, having been born on the banks of Black River, south of Neillsville, and living in this locality all his life. He had a peculiarly genial disposition and was well like by all who knew him. He was also in his way very religious. In the summer of 1934, when the drought was at its worst, he told the writer that his memory ran back over 70 years and he had never seen so destructive a drought. He held to the theory that mankind, especially the white race had become so puffed up with the pride of their accomplishment, and had forgotten their dependence upon God that the drought had been sent to humble their pride. His wife died a good many years ago. A son James Carimen, who served over seas and was gassed on the battlefield, came home and died a few years later, leaving a widow and little son, who survive the grandfather. Government insurance left by James Carmen to his father had kept him in comfortable circumstances. About five weeks ago he became ill and was cared for at Neillsville Hospital until his death. Burial took place in the Indian cemetery near Dells Dam, the Indian Ceremony being used. Respecting Mr. Greengrass wishes his body was wrapped in deer skins and a hole made through the rough box and coffin through which the spirits can enter with food. The funeral rites include four days of feasting, friends of Mr. Greengrass assembling each evening to feast at sundown and eulogize his memory. On the fourth evening the feast and services last all night with the men playing cards and other games while the women spend the evening, in visiting. During the World’s Fair of 1893 at Chicago, Mr. Greengrass was a member of the *The remaining 3 lines cut off. James Carimon died at Mt. View Sanitarium, Wausau, April 10, 1921, a few days after going there for care. Deceased was well known in this vicinity (Clark County, Wis.) as a bright, intelligent young man, greatly liked by all who knew him. He was a Winnebago Indian, well educated, and of high character. He enlisted early in the war and made a fine record as a brave and efficient soldier. He was gassed while in battle in France, but seemed to partially recover, when consumption set in. The funeral was held in the M.E. Church Wednesday afternoon, Rev. W.T. Scott officiating, the American Legion attending in honor of their dead comrade. Dollie Greengrass, 11 years old student at the Winnebago Indian School, died Dec. 30, at the Marshfield Hospital where she had been for 10 days. The cause of death was given as encephalitis, or inflammation of the brain. Dollie was born Jan. 8, 1922, in Jackson Co, the daughter of Mr. and Mrs. Robert Greengrass. She had been a student at the Indian school for several years. Burial took place at Black River Falls. George Green, a private serving with the Service Company, 128th Infantry, W. N. G at Camp Livingston, La., was called to the bedside of his aged father, Luke Green, arriving at the Indian Hospital at Tomah, Wis., the night before his death, which occurred on October 18. Mr. Green was about 82 years of age, having lived practically all his life in the Dells Dam community until a year ago when George went into the service. He was married to Miss Emma Smoke, who preceded him in death in 1912. They had three children, two of whom have passed away. When George was five years of age he was taken to the Indian Mission at Wittenberg where he attended school until his father remarried and brought him back here to attend the local Indian school with his step sisters and brother. Burial services for Mr. Green were held at the John Mike home at Dells Dam, the Indian ceremonial being performed. Charles Thompson Kingswan, age 53, of Dells Dam, WI died Nov. 2, 1997, at St. Joseph’s Hospital in Marshfield, WI. Charles Jesse Thompson Kingswan was born on April 19, 1944 in Wisconsin Rapids, WI the son of Victor and Cylvia (Thompson) Kingswan. He graduated from Mechanic Arts High School in St. Paul, Minn. And then enlisted into the United States Army on Oct. 15, 1965, serving in Okinawa. After his discharge from the Army on Oct. 17, 1968 he continued his education, graduating from Mc Callester College in St. Paul, Minn. And the University of Minnesota in Minneapolis, Minn. Charles went on to medical school and graduated from Stanford University at Palo Alto Calif., and the University of California at Berkley, Calif. His residency was held in Albuquerque, N. M., Pine Ridge, S. D. and Popular, MT. Once finished with residency he operated a clinic in St. Paul, Minn. He was united in marriage to Jennifer Smith in June of 1977. In 1980 he moved back to Wisconsin. He is survived by two sons: Courage Kingswan of Wisconsin Rapids, Wis., and Silas Quagon of Hayward, Wis., one daughter, Rita Kingswan of Dells Dam, Wis.; two brothers, Kelly (Donna) Decorah of Black River Falls, Wis., and Fred Kingswan of Dells Dam; seven sisters: Alice Mae Kingswan Eades of Wyville, Wis., Sharon Kingswan Harrison of Black River Falls, Wis., Maxine Kingswan of Black River Falls, Georgia Kingswan of Chicago, Ill., Carla Kingswan of Black River Falls, Crystal (William) Young of Dells Dam and Gayle Kingswan Downey of Eleva, Wis. He is also survived by an uncle Ralph Thompson of Fairchild, Wis., and two aunts: Merle Thompson of Dells Dam and Beulah Sayers of Duluth, Minn. Charles was preceded in death by his wife, his parents and an infant brother. The funeral service was held at the Kingswan residence. James Funmaker conducted the service. Burial was in the Dells Dam Indian Cemetery with military rites accorded by the Andrew Blackhawk American Legion Post #129 of Black River Falls and Joseph White American Legion post #442 of Wisconsin Rapids, Wis. Honorary Casket Bearer was Bennet Blackdeer. Casket Bearers were: Forest Blackdeer, Billy Blackwell, Jerry Greendeer, Mike Poolaw, Rex Whitegull and Dexter Yellowthunder. Mrs. Kate Mike, a 79 year old Winnebago Indian, died Monday evening shortly after sundown at her home at Dells Dam. Kate Blackhawk was born at Portage in 1857. She came to Clark Co in 1888 and was here married to John Mike. Twelve children were born to them, three of whom survive to comfort the aged father. The sons are Peter, Jesse and Thomas, all living at home. Other members of the family are Jesse's wife, Josephine and their little daughter, Priscilla. Mrs. Mike was the only Indian Gold Star Mother in the United States who made the trip to France as a guest of Uncle Sam. She made the trip in May, 1933, joining a party of other Gold Star Mothers in New York. She was a member of the Neillsville Women's Auxiliary. The opportunity to visit the grave of her son, Dewey, who was killed in action on Oct. 13, 1918, made her very happy. Shortly before leaving on the trip, Mrs. Mike made the following statement to a reporter of the Neillsville Press, according to a clipping taken from the publication of May 13, 1933, her daughter-in-law, Josephine Mike acting as interpreter: "I want to kneel down on his grave and have a picture taken. It will comfort me in the few years I have left before I join my son. I made a wreath of pine boughs from the trees Dewey played beneath when he was a boy and I am going to lay it on his grave." The funeral was held Tuesday afternoon, the tribal religious ceremonies being performed by her relatives and friends and was largely attended. Mrs F. H. Casler as a representative of the Women's Auxiliary, Herbert Brown and his son, Walter, and wife, long-time friends of the Mike family were in attendance and all were kindly received at the home. She is survived by her husband, John Mike, and by a son, Jesse, who won the 1937 cranberry raking championship at Wisconsin Rapids this fall. Paul Mike, a Winnebago Indian, who made his home with his aunt, Mrs. Kate Mike, and other relatives at Dells Dam, died at the Tomah Indian Hospital Friday. The body was shipped to Neillsville, but owing to blockaded roads could not be taken to Dells Dam till Tuesday, remaining at the depot in Neillsville. Buster Brown took the body down on a truck Tuesday. Funeral services were held Friday at 1 p.m. at the Jesse Mike home on Rt. 2, Neillsville, for Jesse Allen Mike, 71, who died January 5, in a fire at his home in the town of Levis. The Rev. James Selmser officiated, and burial was in the Indian cemetery in the town of Levis. Jesse Mike was born June 16, 1905 in Clark Co to John and Kate Goodvillage Mike. His marriage to the former Josephine Whitepine took place October 29, 1929, in Neillsville. She died February 22, 1961. A veteran of World War II, Mr. Mike was with the 128th Infantry from October 15, 1940, until April 8, 1945, serving in the Pacific. Survivors include two brothers, Thomas Mike of Wisconsin Rapids and Peter Mike of Owen. Two rural Neillsville men died (Jan 12, 1979) from burns and smoke inhalation in the Town of Levis fire early Friday morning, January 12, when an apparent malfunctioning oil stove ignited the small home they were staying in. According to Robert Lulloff, Clark Co coroner, dead were Harry Swallow, 78, and Amos W. Kingsley, 62. The latter was visiting at the Swallow home at the time of the blaze. Lulloff stated that he believed that Swallow had dragged Kingsley’s body from the burning house. He added that Kingsley probably died shortly after the blaze began. Swallow, who spoke a few words at the scene when a neighbor stopped by, died before medical treatment could be administered. First on the scene was Wilfred Mike, a neighbor, who heard dogs barking. He found both Swallow and Kingsley’s body in the snow outside the smoldering structure. It was believed that Swallow sat at a picnic table for a short time before collapsing. (Wilfred Mike is a grandson of Jesse Mike who burned to death in a house fire exactly two years to the day of the Swallow and Kingsley deaths.) Lulloff reported that Kingsley had suffered severe burns on the upper half of his body while Swallow only had burns on face, head and hands. The coroner added that he would probably rule that Kingsley’s death was due to burns while Swallow’s was due to smoke inhalation and exhaustion. Destroyed was the house in which the two men were staying and a new small house just a few feet away. The new home had not been moved into yet. Time of the fire was placed between 5:00 and 6:00 a.m. with Mike arriving on the scene around 7:00 a.m., and officers a few minutes later. A fire department was not called to the scene, Lulloff reported, due to nothing remaining of the houses at the time of the neighbor’s arriving on the scene. Note: See Dells Dam School photo of 26 Oct 1912 that includes teacher Elizabeth and student Harry Swallow. Mrs. Rachel Winneshiek, 96 year old Indian mother, passed away at her home at Dells Dam Tuesday, April 19, 1938. Mrs. Winneshiek was born in La Crosse Co and after the Indian lands were ceded to the United States government she traveled with her tribe to Dakota and Nebraska in search of a new home. Returning to Wisconsin, she settled near Black River Falls. She is survived by two children Richard Winneshiek and Mrs. Geo. Garvin. Her husband died about 25 years ago. Although she had been blind for many years, Rachel never lost interest in her life, nor did her friends and relatives lose faith in her judgment. She was possessed of a forceful personality, ever active, yet gentle and kindly in manner and was sought out as an advisor by the Indians in her community. She took a keen interest in the Indian school and its progress, and delighted in the frequent calls of Rev. Ben Stucki. A granddaughter, Ann Winneshiek, worked on the staff of the school for six years and a grandson, John is still employed there. Funeral services were held at Dells Dam conducted by Rev. Stucki, the Indian ceremonials being in charge of her brother, Geo. Funmaker, of Black River Falls. Burial took place in the Dells Dam Indian Cemetery. There was a large attendance, most of the Indian school staff and some of the pupils being present. Amos Bearhart, one of the most intelligent Indians in the state, died at his home some eleven miles south of Neillsville, Clark County, last Saturday, June 19, 1890. Mr. Bearhart was interpreter for the Winnebagoes, and an unusually well educated Indian. He met with an accident last fall or winter, and several philanthropic people endeavored to collect sufficient funds to send him to the Oliver Wendell Holmes Hospital at Hudson. Their efforts were but partially successful. However, Mr. Bearhart was at no time sufficiently recovered from the accident to have been moved. He will be a great loss to the Winnebago Tribe living in his neighborhood. He was their guide and counselor, and what few have prospered owe their prosperity to his guidance. Amos Bearhart was a familiar figure on the streets of this city. Physically he was a powerful Indian of commanding appearance, and would attract attention everywhere. Gladys Blackdeer, a former pupil at the Indian School, died at her home near Black River Falls Jan. 20, aged 17 years. She had been at the State Tuberculosis sanitarium at Wales, but was brought home when she failed to gain. She leaves five brothers and two sisters, several of who are pupils at the Indian School. Forest C Blackdeer, age 54, of Black River Falls, died June 4, 2003 at his home. Forest was born on March 12, 1949 at the Blackdeer Homestead, near Black River Falls, to Wilbur and Emily (Waukon) Blackdeer. He attended local schools and enlisted in the US Army at the age of 17. While in the Army, Forest served in Vietnam. He later became employed as an ironworker in Indiana, Chicago and Minneapolis/St. Paul. Forest had lived in Indiana, Chicago, Minneapolis, and Dells Dam (Neillsville area) before returning to Black River Falls. He currently was living at Sand Pillow Village. Surviving him are eight daughters, Lynne (Beau) Tipery, of Madison, Neile Decorah and Violet Blackdeer, both of Tomah, Rhiannon Blackdeer, of Michigan, Myra Jo, Ember, and Rita Rose Blackdeer of Neillsville, and Buffy Decorah, of Shawano; a son, Waukon Blackdeer of Neillsville; his mother, Emily Blackdeer, of Black River Falls; four sisters, Gladys (Alvin) Cloud, of Lyndon Station, Ida (Wallace) Carrier and Marcella Cloud, both of Black River Falls, Myra Jo (Darren) Price, of Tomah; two brothers, Bennett (Lani) Blackdeer of Neillsville, and Royce (Melva) Blackdeer of Anadarko, OK. Preceding him death is his father, Wilber Blackdeer; a brother, Arlie Blackdeer; two nephews, Carson Cloud and Michael Cloud; and a niece, Luella Blackdeer. Funeral services were at the Blackdeer Homestead and burial with military honors by the Andrew Blackhawk American Legion Post #129 and Auxiliary Unit, were in the Blackdeer Homestead Cemetery, rural Black River Falls. Mrs. Wilbur Blackdeer died at the Indian Hospital in Tomah, May 21, and funeral services were held at the Indian Mission near Black River Falls, May 23, Rev. Ben Stucki officiating. She was about 25 years of age. Her maiden name was Ruth Payer. In 1930 she was married to Philip Blackhawk and lived on a small place near the Dells Dam Bridge. Two children were born to them. About three years ago Blackhawk died and some time after she married Wilbur Blackdeer. To them a son was born. This child died a few months ago, also the younger Blackhawk child. The older boy Harry Blackhawk survives, and is being cared for by Rev. and Mrs. Ben Stucki. Beside this boy and her husband she leaves her father and a brother, Stacy Payer in the town of Hewett. While her opportunity for English education had been very limited, she had quite a brilliant mind, and wrote beautiful letters in almost perfect script and well nigh faultless spelling and construction. The last two years of her life were spent mostly in the Tomah Hospital and the Mount View Sanitarium near Wausau. Lillian Shegonee, a student at the Winnebago Indian School, passed away at Neillsville hospital after a short illness, April 30, at the age of 13 years, 9 months and 12 days. Lillian was born in Wood Township, Wood County, July 18, 1923, the daughter of William and Lean Shegonee. She attended one year in Wisconsin Rapids public schools, finishing the first grade, and had since attended the Neillsville Indian School. She was a faithful student and was a peculiarly sweet and lovely disposition. Funeral services were held Sunday morning May 2, at the Indian school, and in the afternoon at the Indian Mission near Black River Falls, burial taking place in the Mission Cemetery. Rev. Ben Stucki officiated at the services. Miss Hedwig Vollenweiter one of the teachers in the Indian school sang “No Night There” at the forenoon service, and Dan Le Mere an Indian at the Mission sang, “Lead Kindly Light” at the afternoon service. Lillian leaves her parents and six brothers and sisters: Naomi, Celeste, Ellsworth, William, Jr.; Samuel and Oliver, a sister Marilyn preceded her in death. Note: Kathy (b. 15 Oct 1947) and Joby (14 May 1950 – 21 July 1968) Shegonee were legally adopted by Lou nee Qualley and Charles Neff, Jr. (Charles b. 5 Mar 1928 d. 1969) per “Levis-125 years of Progress 1856 – 1981” Neff family, including Joby, buried Neillsville cemetery. April 1948: Seventy years ago the Rev. Jacob Hauser came to this part of Wisconsin and was greeted by old Chief Blackhawk, Winnebago. Said the old chief; “We are glad that you have come. We too believe in Earthmaker. We love our children and shall be glad to see them well trained and well taught.” Last Wednesday evening, the Rev. Mitchell Whiterabbit, great-grandson of Chief Blackhawk, spoke to the people of Neillsville at Zion Reformed Church. He brought, in his own way, much the same message that was brought 70 years ago by Mr. Hauser. He spoke to a congregation, which filled Zion Church to overflowing, with the aisles partially occupied by extra chairs. The occasion was spoken of as a homecoming for Mr. Whiterabbit. He was back among friends whom he made in Neillsville during his long residence here as a boy in the Indian School and a youth in the high school. Since his graduation from Neillsville High School, he has spent eight years in gaining a higher education; four years in college studies at Mission House at Plymouth and two additional years in theological studies there; then a year in Lancaster and McCormick seminaries. At the completion of his seminary studies Mr. Whiterabbit was commissioned chaplain in the U.S. Navy, the first Indian to be so honored. The war ended before he went abroad, and he took temporary service as a supply pastor in a church in Wheeling, West Virginia. During his preparation for the ministry he was strongly desirous of serving white congregations, but he finally came to look upon work among his own people as his calling. So he recently accepted appointment to the Indian Mission at Black River Falls. Mr. Whiterabbit is married. His wife is the daughter of an Arapahoe Indian. December 17, 1969: The Rev. Mitchell Whiterabbit, who has served as pastor of the Winnebago Mission Church, south of Hatfield, and north-east of Black River Falls transferred on Dec. 15 to St. Paul where he has accepted an appointment as executive director of the Minnesota American Indian Center. In accepting the appointment, the Rev. Whiterabbit has asked for a year’s leave of absence from his Mission Church and if the new work meets with his satisfaction, he will permanently be assigned to the Center in St. Paul. The Rev. Jacob Grether, Neillsville, who is presently serving as interim pastor of St. John’s United Church of Christ in Wisconsin Rapids will serve as interim coordinator of the Winnebago Mission Church in Jackson County, on a two-day each week basis. Rev. Grether commutes daily to his duties in Wisconsin Rapids and will be making special trips to the Mission Church to take care of emergency service. The Mission Church will be supplied on a Sunday to Sunday basis by ministers or laymen. The Rev. Jacob Grether was ordained a minister of the Evangelical and Reformed Church of America and served pastorates in Dakota. Gerhardt Habenicht, a student of Hanover, Germany, has been assigned to duty at the Mission in Jackson County, by the Voluntary Service Projects of United Church of Christ in America. He will provide youth and children’s leadership at the Mission. For the present the Rev. and Mrs. Whiterabbit will maintain their home in the parsonage at the Mission, and Mrs. Whiterabbit will remain with their family. At a later date, the Whiterabbit’s hope to relocate to a residence in Western Wisconsin, possibly at Hudson. The Rev. Whiterabbit has served as pastor of the Mission Church for 22 years and during a portion of that time he also served the United Church of Christ at Weyville. Mitchell Whiterabbit is a graduate of the old Winnebago Elementary School in Neillsville and a graduate of Neillsville High School, class of 1934. (Also see Aug 1934 news article) He played on Neillsville High School basketball team that in 1933 went to state tournament. He served as chaplain in World War II and later attended seminary and was ordained a minister of Evangelical and Reformed Church of America. He is now a minister of United Church of Christ (the union of Congregatinal and E & R Churches.) Banner Journal Black River Falls. he would do all he could to bring the gospel to the Indians. As a result, the Sheboygan Classis, in 1876, determined to send a missionary to work among the Indians. The Chief took Rev. Hauser into the woods and showed him a log school house which the Winnebago Indians had built some time before. There in succession, a blacksmith’s apprentice, then a young farm boy, had made brief efforts to teach the children. They had met with little success, largely because of the lack of equipment and the fact that theirs were donated services. Chief Blackhawk also showed Rev. Hauser through the camps where the situation was sad, much sickness, lack of clothing and little food. It was on December 30, 1878, then, that Rev. Hauser opened school in that old log house. There were 10 children in attendance on that first day. Attendance after that day fluctuated greatly. Shortly after Rev. Hauser’s arrival, a church chapel was built. Then the old log school was burned to the ground as a forest fire swept the area. The chapel was pressed into service, also as a school. Among his students on that first day was John Stacy, then a lad of 10 and now an 85 year old Winnebago patriarch and a long-time resident of Clark Co. The Stacys lived on a farm in the Town of Mead, northwest of Greenwood, for about 39 years. (Dec1953 article) John Stacy served many years as an assistant minister and missionary and was a man of sterling character, lay leader and farmer. In 1884, Missionary Hauser, whose wife had died, was forced to discontinue his work, but his place was taken by a man who was to be a material and spiritual leader for 46 years. He was the Rev. Jacob Stucki, who had served as an assistant Indian missionary for three years. The Rev. and Mrs. Stucki established the first boarding school for Winnebago children, by taking into their home, a few children for schooling and boarding. In a short time the group had increased to 30 children, which was more than could comfortably be accommodated with living quarters in the small Stucki home. Soon a school building was provided, primitive in design and equipment. The Winnebago Mission at Black River Falls was the only school being provided for the Winnebago children. The school continued to grow, services were held in a small mission church, but it was 20 years before there were any Indian converts to Christianity. Finally in 1898, three men and a woman took the step and accepted Christ. They were David Decorah, King of Thunder, John Stacy and his wife, Martha Thunderking. Ben Stucki, a son of the Rev. Jacob Stucki, had returned in 1919 from a year of service in Italy with the U.S. Army Ambulance Corp, World War I. He was ready to join his brother, Calvin, in the study of medicine, but when his father asked him to take over the leadership of the new school to be erected in Neillsville. After much thought and prayer, he decided to accept the call to leadership. Benjamin began to look for additional land to construct a new school. He found land in Humbird and Neillsville, but chose Neillsville based on the most community support. In 1920, a total of $56,000 was received from the Women’s Missionary Society of the General Synod of the Reformed Church for the erection of the 42 by 76 building with a wing 27 by 26 for kitchen. In 1920, a total of 33 acres of land was purchased west of Neillsville, 25 miles upstream from the Jackson Co Mission, 200 feet east of the Black River. It was designed for 50 students, but was soon serving 73 Indian children. The new school in Neillsville was dedicated Oct. 9, 1921, with Ben Stucki as superintendent. There was a working farm on the property that gave the children some experience raising pigs and milking cows. But also it provided the food for the students and the staff. The girls learned skills by helping with the cooking and sewing, and cleaning. The children were allowed to speak their native tongue at the school, however, they were to learn English, therefore during certain times of the day, they were restricted to only speaking English. The school held classes for both boys and girls in grades 1 through 8, and was at first a one-room classroom. Later a divider was added down the middle so that two separate classes could be held. The Indian children were enrolled by their parents, none of them were forced to attend. In 1929, the school was enlarged through contribution of a $56,000 fund provided by the Women’s Missionary Society of the Evangelical and Reformed Church, General Synod. This money provided for an addition to the original school building of 42 by 96 feet. The addition was to serve as a girls’ dormitory, additional classrooms, administrative offices, dispensary, sickrooms, library and laundry. The new addition was dedicated Nov. 17, 1929. At one time 125 students were attending classes and living here. In addition to the students, a staff of approximately 10 people also lived within the school. On May 10, 1930, the Rev. Jacob Stucki, a man and minister who had served 46 years in Christian service with the Winnebago people, died, leaving a void that could not be filled. A large procession of Christian Indians followed in the procession that bore his body to its last resting place in the Winnebago Mission churchyard, six miles east of Black River Falls, in Jackson Co. Profound sorrow among the Indians, young and old, marked his passing. Supt. Ben Stucki picked up the torch and carried the program of leadership for 42 years. The children loved Rev. Ben Stucki. He made sure that the children were happy, creating many activities to keep them busy. He made sure they had a full life, never being bored. They conducted plays for the community and made many crafts, such as baskets and beadwork, and then sold them from the school. The children would come to the school in the fall, with many going home for Christmas, and then stay until spring. Some of the youngsters, however, would stay the entire summer, if they so chose. If a child had completed grades 1 through 8, they were given the option of staying here and attending public school. That way many children went on to get a high school education that they probably would not have had the opportunity to achieve under other circumstances. The Indians found it easier to Call Benjamin Stucki "Mr. Ben," which became the loving name for their white leader. With efficiency, foresight able leadership, "Mr. Ben" led the program of material and spiritual living for the Winnebagos in an excellent manner. He had been born in the Indian Mission in Jackson Co, he grew up with dozens of Indian children, who were always in his home or about his yard. He learned to speak the Winnebago language fluently and after being ordained an Evangelical and Reformed church minister, he delivered many a sermon and conducted many weddings and funerals for the Indian people. World War II saw 76 Winnebago names on the roster of service with the armed forces, men and women volunteering for service. In 1941, Ben Stucki directed the organization of the Winnebago Handcraft Cooperative to assist Indians in marketing their handiwork. The cooperative continues today (1963). Through the years, beadwork, baskets and leather good totaling from $8,000 to $25,000 per year have been marketed by this organization. The Rev. Ben Stucki was honored with recognition as doctor of divinity at Lakeland College-Seminary in Plymouth in 1958. Dr. Stucki remained active in the general program, administering not only to Winnebagos, but Chippewas, Oneidas, Potawatomies, Menominees and Indians of other tribes as well. Recognized as one of America’s leading authorities’ in Indian history, legend and lore, Dr. Stucki "sold" the attributes of the Indians as he traveled in many states telling the Indian story to the churches of America. He told how in the inception of the Winnebago School program, Indians were segregated and not welcome in many white schools. "Through the years," said Dr. Stucki, "changing conditions saw many Indian children attending the public school nearest their home. This brought a change in the school program in Neillsville and during recent years a large percentage of the children at the Winnebago School in Neillsville have been orphan children or those from broken homes." Dr. Stucki, in his fund-raising visits to distant churches, told his audience that "few people realize that the Indians contributed greatly to America. Lacking in numbers and unity, they contributed such food as Indian corn, beans, melons, squash, potatoes. The white potatoes are not Irish Potatoes, they are Indian potatoes." He also pointed out that "the Indians once lived better than white man with their crops, fish and game. But they were pushed into small spaces on mostly worthless lands, and have been expected to maintain a livelihood where white people would starve." He urged white people to assist the Indian and set him good examples. Dr. Ben Stucki’s active leadership among the Indians was cut short by his sudden death on Oct. 3, 1961. In the death of Dr. Ben Stucki the Winnebagos and other Indians of Wisconsin lost a sincere and capable leader. No one in the past 42 years has worked as hard or done as much for the Wisconsin Indian than Dr. Ben Stucki, who had been assisted during most of that period by his wife, Ella, who proved a valuable helpmate and a capable leader among Indian girls and women. In 1950, the Rev. Jacob Grether, grandson of the earlier missionary, the Rev. Jacob Stucki, and a nephew of the Rev. Ben Stucki, came to Neillsville as assistant superintendent of the Winnebago School and program. The position of superintendent of the Winnebago program in Neillsville was taken over in Oct. 1961 by the Rev. Jacob (Jack) Grether, who had served as assistant to Dr. Stucki from 1950 to 1961. The school continued until 1957. At that time, the government was encouraging that Indian schools be closed, as they wanted the children to live at home. By that time the public schools were presumably “welcoming” Native Americans. But still, in many schools, they were looked down upon. 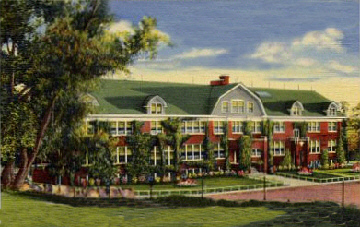 Today (1963) the school at Neillsville is known as Winnebago Children’s Home and it is approved by the state of Wisconsin. The former home of the Rev. and Mrs. Ben Stucki is now Morning Star Home for teen-age girls, the former home of the Rev. and Mrs. Jacob Grether is now Hiawatha Home for teenage boys. The former school is now the home for younger boys and girls. The building also provides the necessary dormitory rooms for staff members, schoolrooms for classes, grades one to three, and for other needs. Sources: Clark Co., WI web-site records transcribed and posted by the many “History Buff” contributors. Unfortunately, census records of the time did not include the Indian population although they too owned land in their own name and their children attended the public schools with their “white” neighbors.